When my friend, Dor, author of Virginia Views, nominated/challenged me to the Five Photos, Five Stories meme here in the blogosphere, I thought “easy-peasy: lemon squeezy”. After all, with the thousands of photos I have on my computer, selecting five and writing a little something about each one shouldn’t be difficult at all. Several years ago, Motor Man and I were in North Carolina en route back from a race and stopped at an antique mall. I spotted an old blue wheelbarrow, so similar to the one from my childhood. But, I decided that I didn’t want to pay the price they were asking, so we left it there. Fast forward to a year later, we were on our way back from the same race, stopped at the same antique mall, and there was the old wheelbarrow….waiting for me. We decided that it was meant to be, but we had one small problem: we were driving a Chrysler Sebring convertible. But, as is usually the case, Motor Man came to the rescue. He borrowed a couple of tools from the owners of the antique mall, and took the wheelbarrow apart to the point that we could fit it in the car. It’s been a fixture on our front porch ever since, and is a sweet reminder of the carefree summer days of my childhood. The rules of Five Photos; Five Stories are to post a photo a day for five consecutive days and attach a story to the photo. It can be fiction or non-fiction, a poem or a short paragraph. Oh yes, and each day nominate another blogger for the challenge. I nominate my blogging buddy Beth Anne of It’s Just Life. This entry was posted in Days at Home, Traveling Days and tagged antique wheelbarrow, five photos five stories, its just life blog, virginia views blog. Bookmark the permalink. I remember the wheelbarrow rides! Thank you for reminding me of fun times I haven’t thought of in years! You are off to a great start with the Five photos, Five Stories challenge!! 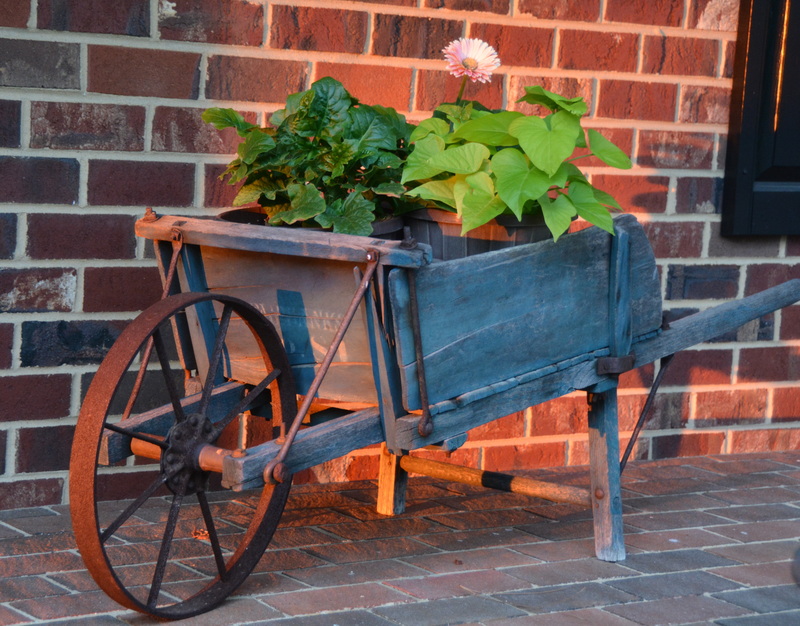 Oh what fun that must have been…….I love wheelbarrows – they sure do come in handy for those of us who are gardeners….AND they do give fabulous rides too! Love the story………………. Pretty amazing the Sebring was able to handle that one ! What a lovely memory and story! Looking forward for the next four. Happy Memorial Day!! Well heck—I just saw that you tagged me and I totally missed it!!! I WILL do this challenge!! I will, I will! 🙂 Sorry—I have been off grid for a bit–lots going on! Thanks! Love your wheelbarrow! PS. I may modify the rules a little bit but I am definitely doing this! Thanks!!!! Hugs! Unique wheelbarrow, and great story to go with it. I like that it was still there waiting for you.